I made this mini album after seeing one on YouTube. I really like how it turned out. I haven't decorated the front yet but I wanted to grab some pictures and document it now. I'm thinking I might use my Cricut Paper Dolls cartridge to whip up some really cute decorations for the cover. I'll post again after I finish the cover. This album has lots of fold out pages and tags that slip into various pockets. I also made a couple extra ones that she didn't include in the video. One is the pocket that has the MVP tag in it. It was just a simple rectangle of paper that I set at an angle and then folded over and glued to the back. If you need more info in how to do it, just leave me a comment below and I'll expand on how to do it. 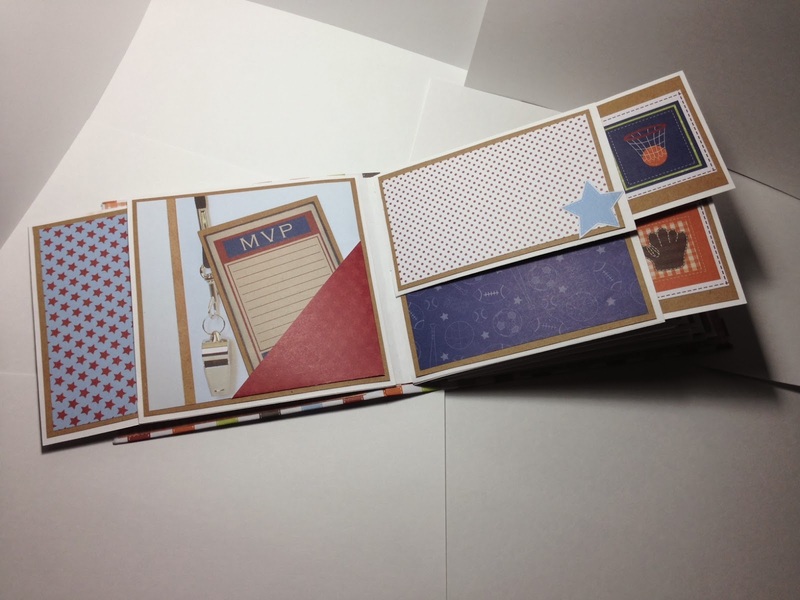 I used the Boyhood paper stack from DCWV and my solid card stock is all from Core'dinations. I followed this tutorial from Ginger at My Sister's Scrapper: http://youtu.be/P3hRZkxb92A This link will take you to the first of the 5 part video series. She does an excellent job of explaining everything and gives you all the measurements you need. I will definitely be making more of these but next time will use actual chipboard for the covers and spine. This one is not very sturdy and will most likely just be a display piece on my bookcase. I highly recommend making sure you have a lot of Scor-tape on hand because you will use it!